Ken Leonard shifts his weight slightly in a plastic orange chair, arms crossed over his chest. The statement hangs in the air of the dim and still locker room. He flashes a slight smile, but his eyes hold most of his amusement. They have a tendency of doing that when he talks about Liz. Nestled in the heart of Illinois, is the capital city of Springfield. A city large enough to have a decent morning rush, but small in enough for it to seem like everyone knows each other … and knows each other well. It’s a place that welcomes visitors with friendly Midwest charm and mannerisms. The type of city that melds together community and history in a way that will surprise you. But perhaps it has nothing to do with the city and more with the people that call Springfield home. People like the Leonard Family. A football family by definition, but one that isn’t defined by football. A family with the most unlikely matriarch to Springfield’s most dynamite football-coaching family. A woman who cared little for the game and the spotlight and more about the people who graced the bleachers, sidelines, and field. This is a story about football. 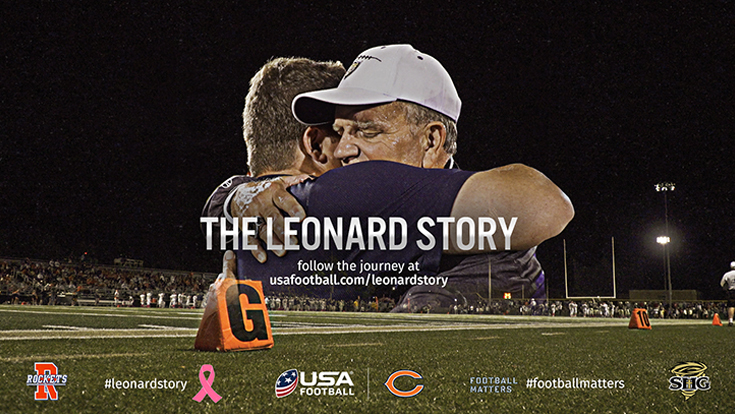 But it’s also a story about faith, family and a remarkable woman named Liz Leonard who was the light and joy within a local football community. This is the Leonard Story.